Sarah Paulson Had One Week’s Notice She’d Be Directing American Horror StoryAll it took was a lot of prep work and some supportive megaphone yelling. Here’s the First Connection Between AHS: Apocalypse and Murder HouseIs that a handsome Antichrist we see? 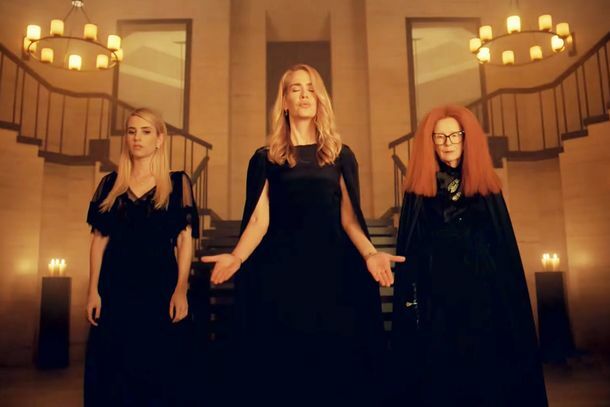 Sarah Paulson’s AHS: Apocalypse Character Is … an Evil Bingo Host?Her shoulders are very intense. 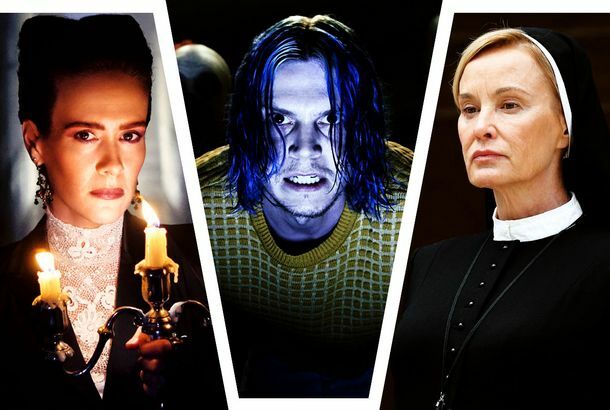 What Sarah Paulson and Evan Peters Bring to American Horror Story: CultBy embracing over-the-top drama, they saved AHS: Cult from itself. Ellen DeGeneres’s Clown Scares Left Sarah Paulson Whimpering Under a TablePaulson gets not one, not two, but three scares. Ryan Murphy’s One Flew Over the Cuckoo’s Nest Prequel Lands at NetflixAny excuse to keep delaying American Crime Story: Katrina. Everything We Know About American Horror Story: Cult So FarThe seventh season of the show involves clowns, bees, and the 2016 U.S. presidential election. AHS: Cult Trailer: Sarah Paulson Gets Terrorized by Trump’s Clown-Filled AmericaPaulson and Evan Peters have two dramatically different reactions to Election Night 2016. American Crime Story: Katrina Gets Overhaul — But We’ll Still Get Sarah PaulsonThe installment is also getting new source material. Sarah Paulson Reveals a Big Detail About Her AHS: Cult CharacterAnd it has a lot to do with Alison Pill. Rebel in the Rye Trailer: J.D. Salinger Is a Tortured HottieAren’t we all? Cuba Gooding Jr. and Sarah Paulson Sang Show Tunes TogetherAll is forgiven. Sarah Paulson Recommends Sarah Paulson to Play Trump in AHS Election SeasonSo, who will play Hillary Clinton then? Sarah Paulson Reveals Which American Horror Story Character She’d Like to ReviveWho could it be? Ryan Murphy Is Angling for Sarah Paulson As Linda Tripp on American Crime StoryLooks like some more very special Sarah Paulson hairdos are in store. Sarah Paulson to Star in Crime Drama Lost GirlsIt will be the narrative-feature debut of documentarian Liz Garbus. The Best Golden Globes Nomination Reactions So FarFrom thanking Russia to crying on a couch with mom. Watch Lana Winters Return in the American Horror Story: Roanoke FinaleOh hello, Ms. Lana Banana. Sterling K. Brown May Join American Crime StoryReady the fanfiction! Rihanna and Sarah Paulson Film Ocean’s EightBad wig alert. Blue Jay and the Power of Ambivalence in Abortion StoriesIt’s the last 15 minutes of the film that deserve extra attention. Sarah Paulson Cries to ‘Dear Theodosia’ on the Hamilton Soundtrack, TooSometimes we all need a good cry. Your Girl Sarah Paulson Sings ‘Shoop’ on FallonIn which you felt it in your hips. Watch Sarah Paulson in the Blue Jay TrailerComing to theaters October 7, and Netflix soon after.